When it comes to eating right, lunch is the time it can all go wrong. Many of us start the day with a healthy breakfast and buy all the best ingredients to prepare a nutritious dinner, but it’s during the day that the wheels can easily fall off – and the pounds can pile on – especially during winter when hot chips seem more appealing than cold salad. Unfortunately it won’t just be your waistline which will suffer. Poor midday eating habits contribute to lethargy, high stress and succumbing to the 3pm sugar frenzy – whether you’re a high-powered professional or a manic mum on the go. Appealing as they may seem when it’s cold outside, starchy staples such as white bread and rice, pasta, hot chips and baked potatoes are packed with empty carbohydrates that will leave you feeling bloated, fatigued and flat for the rest of the day. Instead, opt for a protein like meat, chicken, fish or tofu, and pair it with a fresh salad or side of warming steamed greens and good fats to enjoy long-lasting energy throughout the day. Forgetting to eat lunch altogether isn’t the way to maintain concentration throughout the day – or lose weight. Skipping lunch will leave you ravenous mid-afternoon, which is a surefire strategy to cave in to those sugar-laden cravings once your energy starts to dip. If you have to grab something on the go, opt for a tasty low-carb option such as Atkins Advantage Fudge Caramel 60g bar, with only 2.9g of carbs and 15g of protein its sure to keep you feeling satisfied for longer. By planning your lunch choices ahead you’re more likely to forgo fast food and fill up on fresh options instead. Leftovers are a top pick – just make more salad or stir-fry the night before and add a piece of cooked protein to pack extra punch. Low-sugar fruits such as strawberries and blueberries are excellent snack picks, as are small containers of nuts, carrot and celery sticks with homemade hummus, or for something a little more convenient opt for a low carb bar like Atkins Advantage Cappuccino Nut. Adding protein and good fats into your lunch will help you feel full for longer – but portion control is king. Protein such as lean meat, fish or tofu should be limited to around the size of one fist, in addition to healthy fats in the form of a quarter of an avocado, or a dash of olive oil. Salad and nutrient rich low carb veggies can be the size of two fists. If you’re dining out with work, avoid pasta and rice and pick side salads over chips or mashed potato. Many popular beverages are packed with carbohydrates (a 600ml bottle of Coke contains 13 teaspoons of sugar, 250ml of apple juice has five teaspoons of sugar and 27.5 grams of carbs) so opt for mineral water and herbal teas instead, or try an Atkins ready-to-drink shake instead of your mid-morning latte. Serves 1, 4.1g of carbs per serve. Slice eggplant into thick slices and drizzle with oil. Cook for around 20 minutes on a sandwich press or under the grill or until eggplant has softened. Remove from the heat, and place the crispiest side bottom down. 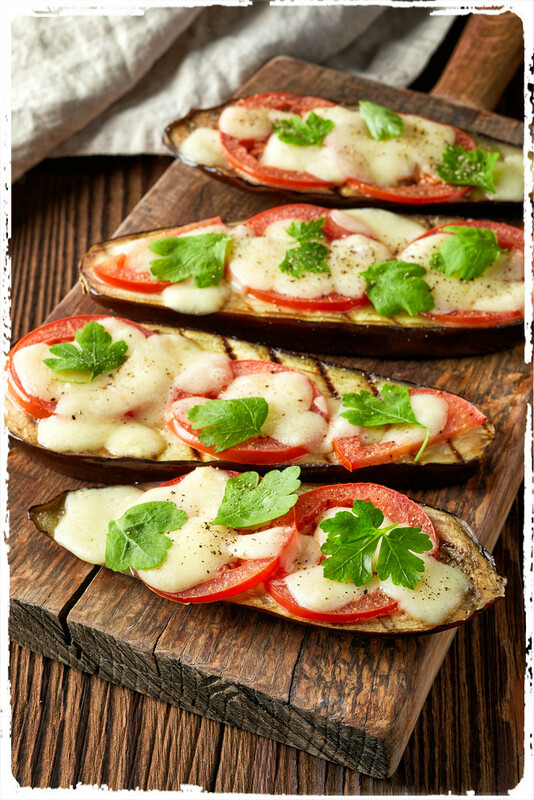 Arrange tomato evenly on the eggplant slices, and top with cheese. Place eggplant under the grill – or if using a sandwich press combine two eggplant stacks to face each other like a sandwich. Cook until cheese melts, and finish with fresh coriander leaves. For additional protein try adding sliced ham or chicken. Serves 1, 7g of carbs per serve. 1 egg (if an egg is too tricky for work, swap this out for ¼ bbq chicken without the stuffing). Spiralise or peel zucchini into spaghetti length pieces. Poach, fry or boil the egg – leaving the centre slightly runny – and set to side. Mix pesto through the zucchini, then place in the microwave for around 20 seconds to warm. 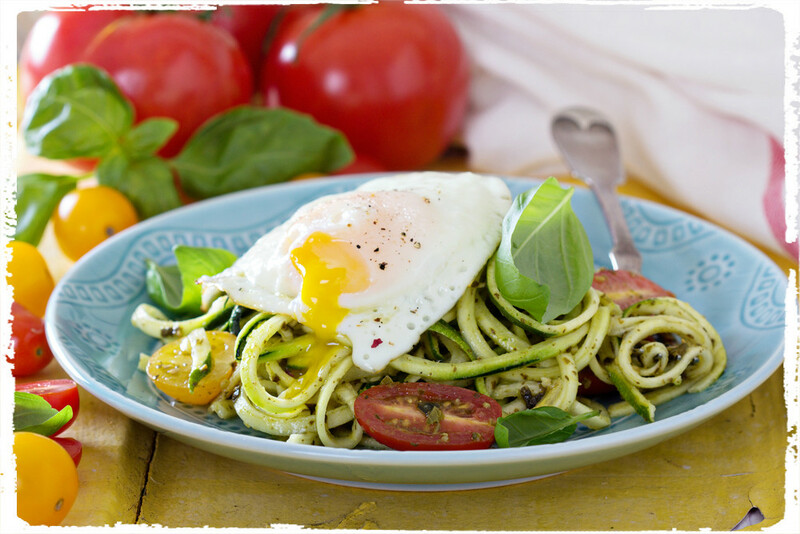 Transfer the zucchini mix onto a bowl or plate, add cherry tomatoes, basil pieces and top with the egg, and enjoy! Serves 1, 6.8g of carbs per serve. Pre-make taco mince the night before. In a pan, heat olive oil and sauté onion and garlic until they begin to caramelise. Add in mince and cook until brown. Add in taco seasoning along with a tablespoon of water, and stir until all the mince is covered. Remove from heat to cool, and refrigerate overnight. On a plate lay out lettuce leaves. Heat mince until warmed through, and evenly soon mixture into the leaves. 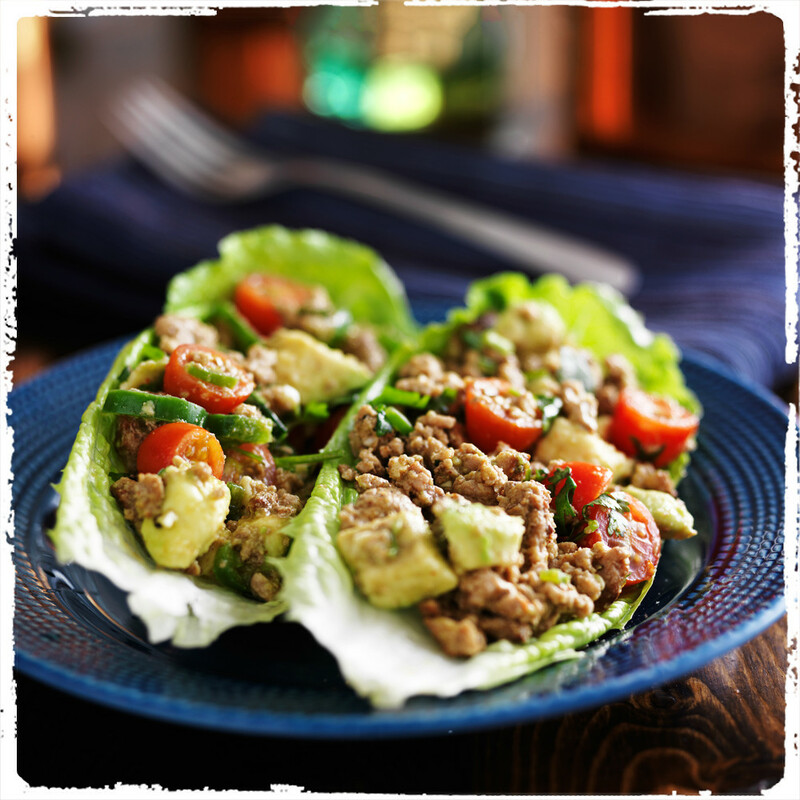 Top with cherry tomato and avocado pieces, wrap (or leave open), and enjoy!